An investigation into charter schools’ dishonest and unconstitutional science, history, and “values” lessons. 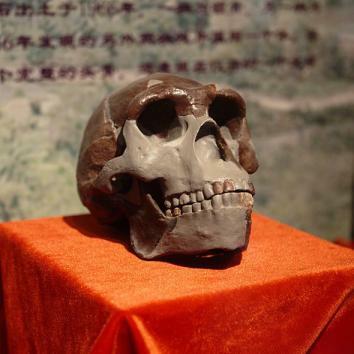 A replica of the Peking man skull presented at the Paleozoological Museum of China in February 2009. Evolution is not a scientific controversy, and there are no competing scientific theories. All of the evidence supports evolution, and the overwhelming majority of scientists accept the evidence for it. 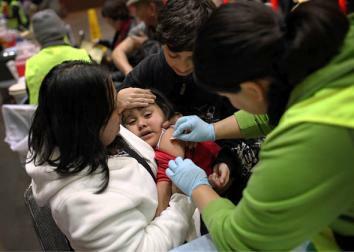 A girl reacts to receiving the H1N1 flu vaccination in 2009 in San Francisco. In 1987, the Supreme Court ruled in Edwards v. Aguillard that teaching creationism is unconstitutional. In the 2005 Kitzmiller v. Dover case, Judge John Jones III ruled in federal district court that intelligent design is still creationism and equally unconstitutional. Bringing creationism into a classroom by undermining evolution and “noting … competing theories” is still unconstitutional. 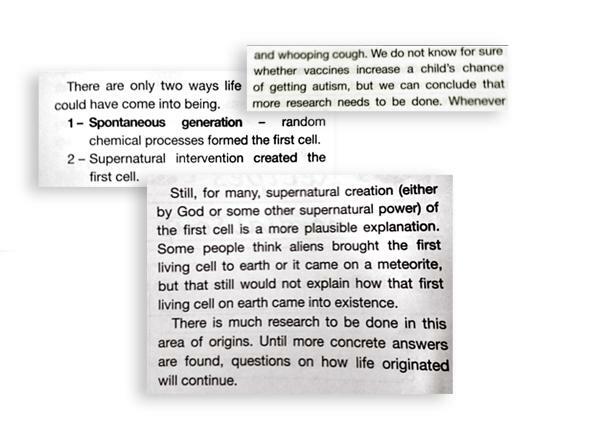 What’s more, contrary to Gonzalez’s statement, teaching about supernatural creation in the section on the origins of life is doing far more than noting competing theories. In a previous Slate column on the Texas textbook wars, I explained that Texas’ current science standards were designed to compromise the teaching of evolution. 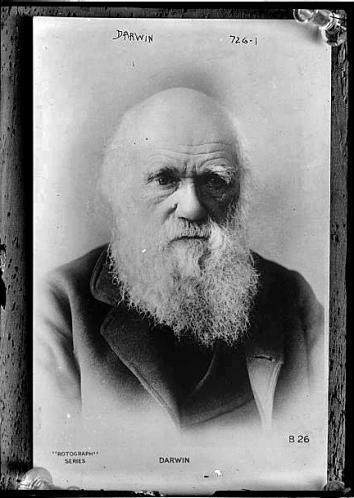 The standards require teachers to “analyze, evaluate, and critique” evolution and teach “all sides” of evolution to encourage “critical thinking.” These requirements are a back-door way to enable teachers to attack evolution and inject creationism into the classroom. If teachers are questioned on their materials, they can shift the responsibility for what they’re teaching onto the state. I asked Gonzalez if these science standards played a role in Responsive Ed’s curriculum on evolution, and her answer was yes. Last month, science won the day in the battle over textbooks, and Texas adopted texts that teach evolution. But schools don’t necessarily have to adhere to this list of textbooks. They can choose, as Responsive Ed does, to use alternative textbooks, which may teach creationism. Greg Abbott, the current attorney general and front-runner in the Texas governor’s race, seems to be of a similar mindset. One piece of his campaign literature shows a gun and a Bible and includes the phrase, “Two things that every American should know how to use … Neither of which are taught in schools.” Abbott’s campaign hasn’t responded to questions about Responsive Ed or creationism in schools. Science isn’t the only target of the religious right. The movement also undermines the study of history. I received a set of Responsive Ed U.S. history “Knowledge Units” through my public records request and discovered problems there, too. In the section on the causes of World War I, the study materials suggest that “anti-Christian bias” coming out of the Enlightenment helped create the foundations for the war. The workbook states, “[T]he abandoning of religious standards of conduct and the breakdown in respect for governmental authority would lead to one of two options: either anarchy or dictatorship would prevail in the absence of a monarch.” Responsive Ed also asserts that a person’s values are based on solely his or her religious beliefs. 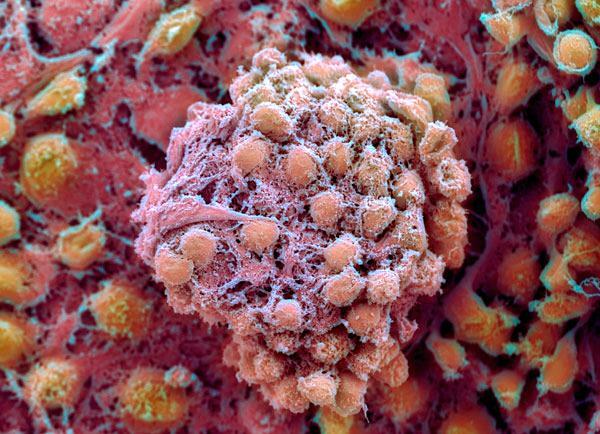 A colored scanning electron micrograph of human embryonic stem cells. About LGBTQ rights, Responsive Ed says, “Laws against the homosexual lifestyle had been repealed in many states, but some states continued to ban the behavior.” The homosexual lifestyle? Instead of being taught that 16th-century Spain had a monarchy, students at Founders Classical Academy are incorrectly learning that it had a form of republican government that was superior to anything that “native peoples” had created. A Patriot’s History of the United States also addresses the “pinnacle” of the “western way of war” as demonstrated by the Iraq War and questions the legitimacy of Secretary of State John Kerry’s “suspect at best” Purple Hearts and Bronze Star. The values taught by Responsive Ed can often be found word for word on Gothard’s website. The Responsive Ed unit on genetics includes “Thoroughness: Knowing what factors will diminish the effectiveness of my work or words if neglected.” The only difference is that Gothard’s website also adds “Proverbs 18:15” after the quote. Responsive Ed and Character First may have removed the references to God and Bible verses from the curriculum that is being used in public schools, but it is clear that the line between church and state is still being blurred. And nothing that Gothard has created should be allowed near children. In late October, I visited iSchool High, a Responsive Ed public charter in Houston, and asked the campus director, Michael Laird, about reports that the school was teaching creationism. A few days before my visit, writing for Salon, Jonny Scaramanga, an activist who reports on Christian education, had exposed a section of iSchool’s curriculum that blamed Hitler’s atrocities on the theory of evolution. Scaramanga had been sent the curriculum by Joshua Bass, the parent of a former iSchool student. Bass rightly viewed this curriculum as an attempt to sneak religion into the classroom and teach creationism. I was quickly shuffled out, but while I was not allowed to see any curriculum or talk to any teachers, I did get to look into a classroom from the outside and verified that the setup looked exactly like a picture of an Accelerated Christian Education classroom I had seen on Scaramanga’s website. ACE is a popular Christian home-school curriculum that’s also used in many private schools and publicly funded voucher schools. It’s the most infamous Christian home-school curriculum and for years taught that the Loch Ness monster was real in its attempts to disprove evolution. Bass discovered that Responsive Ed was founded by Donald Howard, who had also founded ACE. But it wasn’t immediately clear exactly how interconnected these two organizations are. ACE and Responsive Ed are both headquartered in Lewisville, just 4 miles apart, and staff members appear to rotate between the two organizations. When I asked Responsive Ed’s Gonzalez about her charter network’s history with Howard and ACE, she said that none of the ACE founders, including Howard, had been associated with Responsive Ed for the past seven or eight years. But I found that five members of Responsive Ed’s current board and leadership group used to work for ACE (also known as School of Tomorrow). Responsive Ed’s current CEO, Charles Cook, spent several years in charge of marketing at ACE before he joined Responsive Ed, and he designed the original curriculum that Responsive Ed used. One figure stands out when it comes to revealing the political and religious agenda behind the Responsive Ed charter schools. ACE’s former vice president, Ronald Johnson, founded a curriculum company, Paradigm Accelerated Curriculum, which also ran four public charter schools in Texas. Paradigm’s curriculum teaches abstinence in English class. ChristianBook.com describes the science curriculum as teaching “evolution from a young-earth creationist perspective.” Paradigm’s website also says that the curriculum is “carefully designed to equip high school students to defend their faith” and is being used in public schools in 11 states. Paradigm and Johnson are closely connected to Responsive Ed. In 2010, Responsive Ed absorbed Paradigm, taking over its schools and replacing its board. Paradigm noted in a press release that this allowed Responsive Ed to “incorporate the PACS system and curriculum across Texas and in other states.” The release described this as “a ‘win-win’ situation for both organizations” because Responsive Ed schools already use a “learning system based on a manual designed and written by Dr. Johnson while he was Vice President of [Accelerated Christian Education].” Before 2010, Responsive Ed and Paradigm operated on the same model, and now Paradigm and Responsive Ed are the same organization. The release also added that Johnson would continue his role in marketing Paradigm curriculum (now for Responsive Ed) and would train Responsive Ed’s teachers and help design the curriculum used in their schools. While Responsive Ed attempts to preserve a facade of secularism, on the Paradigm website, Johnson is far more explicit about his goal of subverting charter programs. He thinks that school choice is the way to bring “Judeo-Christian values” back into classrooms and cites other right-wing activists including Tim LaHaye, John Hagee, David Barton’s WallBuilders, Jerry Falwell, and Focus on the Family as champions of using education reform to do this. There’s just one problem. Johnson recognizes that “a major weakness exists in the school choice movement.” Charter schools are still public! These former ACE executives, according to Johnson, are pretending to observe the “so-called ‘separation of church and state’ doctrine” in order to use charter schools like Responsive Ed as a Trojan horse to sneak religion back into public schools. Will anyone sue to stop them? There are more than 17,000 students in Responsive Ed schools, and any one of them, or their parents, could file suit because their constitutional rights have been violated. Rather than it taking a lawsuit, I hope that legislators will take the appropriate actions to regulate these schools and improve Texas charter policy. Texas has capped the number of charters in the state at 300, and when bad charters that teach creationism are allowed to remain in the system, it prevents other charter operators from opening better schools. It’s fundamentally anti-charter to allow Responsive Ed schools to remain in Texas’ program. Responsive Education Solutions must have their charter revoked. 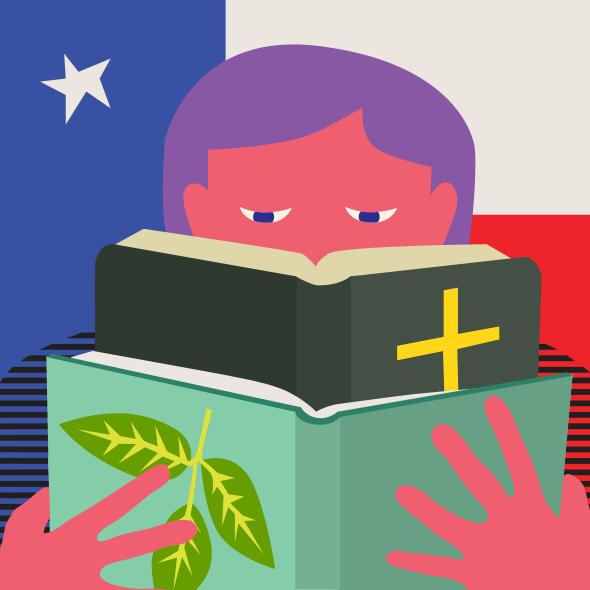 It is clearly past time for Texas to tighten the rules surrounding charters and enforce accountability to prevent any other religious programs from subverting the public education system. Correction, Jan. 16, 2014: Two photo captions had incorrect information. The caption of the photo of the ACE headquarters incorrectly stated that it is also an image of the Responsive Ed headquarters. It is not. 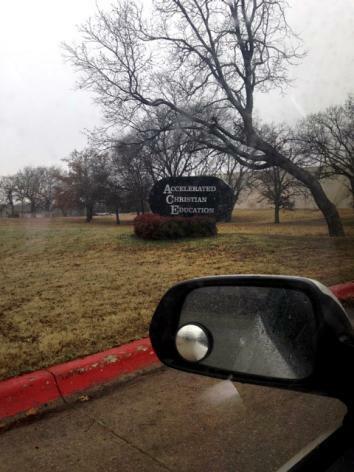 Additionally, the ACE headquarters is in Lewisville, Texas, not Dallas. A second photo caption identified the image as excerpts from A Patriot’s History of the United States. The excerpts are from Responsive Ed workbooks.